As the marketplace continues to accept more products from the cannabis industry, there are more questions than there are answers. For most, the idea of cannabinoids is confusing and overwhelming. Why should someone need to know about organic chemistry to understand how the product they’re consuming affects them? The answer is they should not have to, but it’s also beneficial to be aware of how it will affect them and what to call it. If you find an effect you enjoy or want to adjust your current product to include or exclude an effect, you will at least need to know the name of your cannabinoids and terpenes so that you can discuss the desire to change with someone else. It all comes down to communication. In this article, True Terpenes will share the nine of the most common cannabinoids, as well as some terpenes that you can use with your cannabis products to enhance the experience. Want to shop terpenes now? Find the terpene isolate or strain profile for you. Otherwise, continue reading to learn more about cannabinoids. As the main constituent in cannabis, THCA converts to delta-9-THC when heated, vaporized, or burned at specific temperatures. THCA and other cannabinoids like CBDA and CBGA contain the highest level of COX-1 and COX-2 inhibition. THC is the most common cannabinoid in marijuana. If you’re looking for the “high” feeling, THC is the cannabinoid you want to look for; it’s constituent responsible for the psychoactive effects so many correlate with marijuana. Elevated CBD levels in cannabis equate to CBDA being the primary constituent. Specifically, CBDA inhibits the COX-2 enzyme when smoked or consumed. With great potential, CBD is being researched and studied as an alternative treatment in the medical field. It is the antagonist to the CB1 and CB2 receptors in your endocannabinoid system, which helps regulate how much good your immune system does when protecting your body. Although the studies and the research is still being founded, the data is showing a positive trend toward CBD being an alternative. CBN is created off the back THC degradation. It is not found naturally in cannabis plants, but it is a valuable byproduct that most cannabis consumers call “couch lock.” CBN is an antagonist for both the CB1 and CB2 receptors, but it more often targets CB2. CBG is a non-psychoactive cannabinoid that has the ability to alter the overall effects of cannabis. As an antagonist, it has a low affinity for CB1, and its effects on CB2 are still unknown. Commonly found in the “sweeter” cannabis strains, CBC has been shown to mediate through non-cannabinoid receptors in the body. It has also been shown to affect other cannabinoids in what’s known as an entourage effect. Only found in a small variety of cannabis strains, THCV produces much different effects than THC or THCA. Due to the propyl (3 carbon) group in THCV, the effects will vary compared to the THC propyl (5 carbon) group. THCV is an antagonist for CB1 and a low-affinity antagonist for CB2. 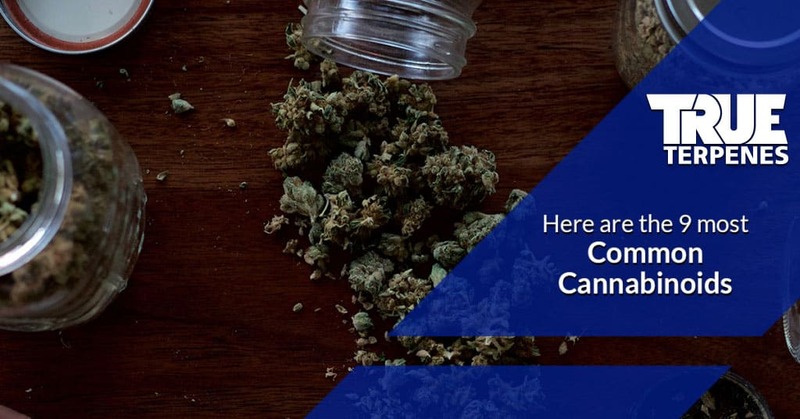 CBDV is different from CBD in the same way that THCV is different from THC. The propyl group is altered, which creates different effects on the consumer. Also, the early stages of research show that CBDV interacts with the TRPV1 receptors, which may have potential medical benefits once more data is uncovered. Shop Terpenes For Sale Now! Now that you’re aware of the nine most common cannabinoids, it’s time to consider the best terpenes for sale online right now. At True Terpenes, we offer a wide variety of terpene isolates and strain profiles. You can enjoy our terpene products on their own, or you can add them to other consumables like foods, beverages, or buds. Shop our terpenes for sale online now! Matt Chavez presents a True Terpenes Super Lemon Haze CocktailDo You Know The Difference Between Cannabinoids and Terpenes?